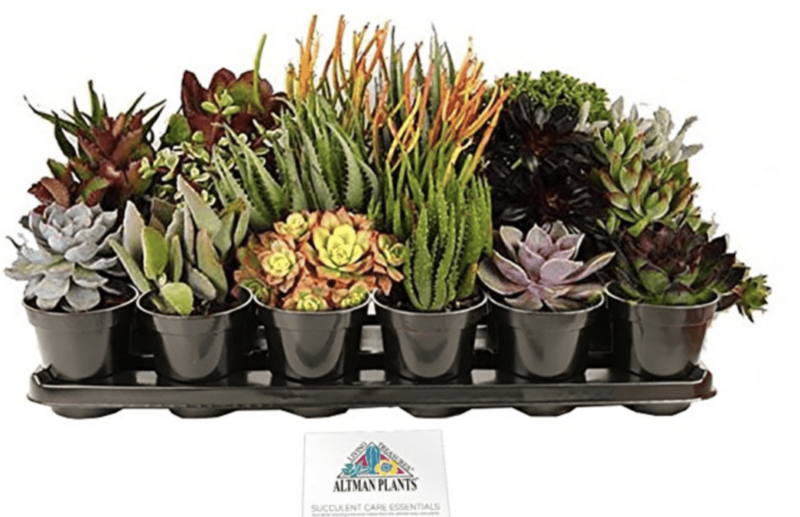 Wondering how to buy and shop for succulents online? For sempervivums, haworthias and other cold-climate or indoor succulents, I recommend Mountain Crest Gardens. 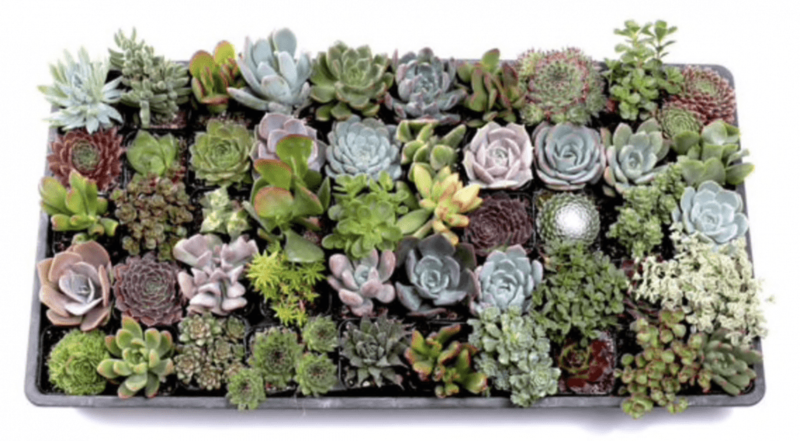 Update: They recently introduced a highly competitive “Ultimate Succulent Sampler Tray” with 50 varieties in 2-inch containers. 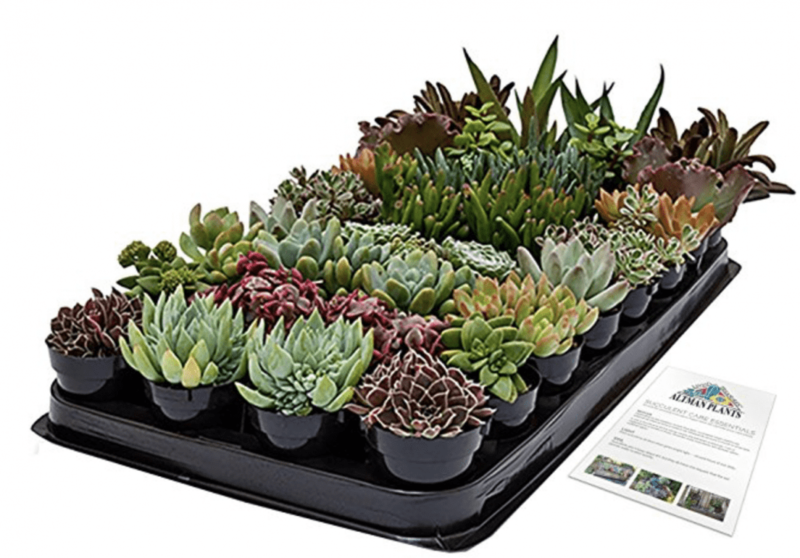 Although I get a tiny commission from Amazon for orders that originate from links on my site, I’ve hesitated to recommend any of their succulent vendors…until now. Succulents in 2.5-inch diameter nursery pots are your best deal; expect to pay double for bigger specimens in 3.5-inch pots. The difference is six months to a year’s growth. This is Altman’s larger of two echeveria assortments. Use it to make a Gift Basket of Echeverias. Be sure to see my article: All About Echeverias: Succulent Roses That Last. For container gardening tips and ideas for echeverias, see my post: Perfect Succulent Art-Pot Pairings and my book, Succulent Container Gardens. Succulents are perfect for getting kids into gardening, and you have to love the names: kitten paws, Shreck’s ears, panda plant, ‘Chocolate Soldier’, cobweb houseleek and zebra plant. Enjoy my posts: Succulents + Kids = Great Summer Memories and LA’s Kids Day Features Succulents. Haworthias and dwarf aloes prefer low-light conditions. Jade will tolerate them, but will lose red on its leaf tips. See my posts, How to Keep Succulents Happy Indoors and How to Grow Tender Succulents in Northerly Climates as well as my book, Succulents Simplified pp. 138-143 and the corresponding video Make a Low-Light Succulent Dish Garden. The description says, “product mix may contain Aloe ‘Minibelle’, Aloe nobilis, Aloe zanzibarica, Gasteria varieties, Haworthia fasciata (zebra plant), Rhipsalis capilliformis, Rhipsalis cassutha, or Rhipsalis salicornioides.” Rhipsalis (top right and lower left) makes a good filler, trailer and hanging-basket plant. Use assorted succulent collections to make succulent bouquets, fill vintage and repurposed containers, for a succulent color wheel centerpiece, my online Stunning Succulent Arrangements class, and designs and projects in my books, Succulent Container Gardens and Succulents Simplifed. See my posts: Is Cactus the New Black?, Create a Cactus Curio Box, and I Come Out as a Cactus Lover. 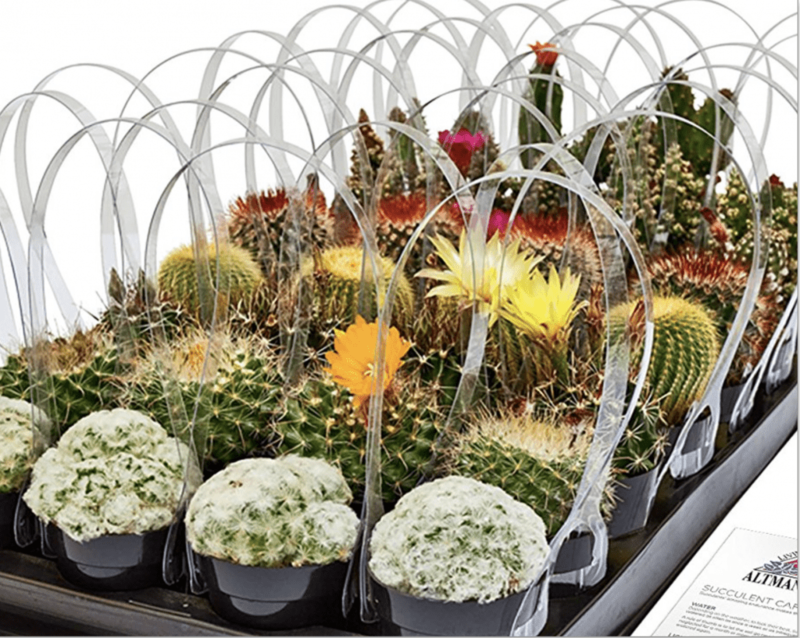 Be sure to see the cactus section of Designing with Succulents, 2nd ed., pp. 192-201. *If you’re looking for solos or specific kinds, order through a specialty nursery near you, shop at CSSA shows, or Google the plant’s name to get mail-order sources. 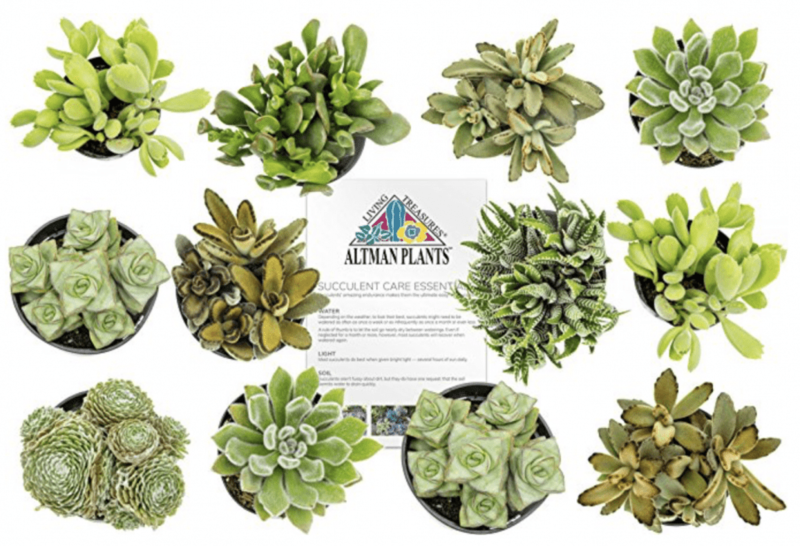 If you specifically want succulents grown by Altman, check the garden sections of big box stores or Altman’s online shop.